The recent sell-off in stocks follows last week's Fed action, when the central bank made clear that it intends to tame inflation whatever the costs, Jim Cramer told his Mad Money viewers Tuesday night. But it's not clear which way rates are actually going to go, with Wall Street split into three camps. In Cramer's view, recessionistas believe the Fed will keep tightening until there's an economic slowdown. Inflationistas believe that rates are too low. A third, moderate camp, feels that rates have already peaked and are likely to go back down. To get a sense of how to play each scenario, Cramer talked with Bob Moreno, a RealMoney.com contributor, and publisher of RightViewTrading.com. Cramer and Moreno started by looking at the yield on 20-year Treasury bonds vs. the performance of the S&P consumer staples ETF, the (XLP - Get Report) . Over the past 20 years, long-term Treasury yields have gone steadily lower. At the same time, the consumer staples have an almost perfect inverse correlation: when Treasury yields go lower, the soft goods stocks go higher making them bond-market alternatives. The negative correlation really accelerated in 2011, when the yield on the 20-year dropped below 3%. The staples index has more than doubled in the past seven years, because for most of that time the bond market competition was practically nonexistent. Moreno's concerned, because earlier this year, the 20-year crossed back above 3% and it's currently at 3.29%. If you think rates are headed still higher, consumer staples are going to get hit hard. But if recessionistas are right about a Fed-mandated economic slowdown and rates go back below 3%, then the consumer staples and the utilities -- all the slow and steady bond market alternative stocks -- can go higher again, according to Moreno. If that's your view, then Moreno thinks you should take a look at the daily chart of Phillip Morris International (PM - Get Report) , the global tobacco company. Phillip Morris sports a 5.6% yield. The stock has been stuck between $74 and $85 for the past few months. 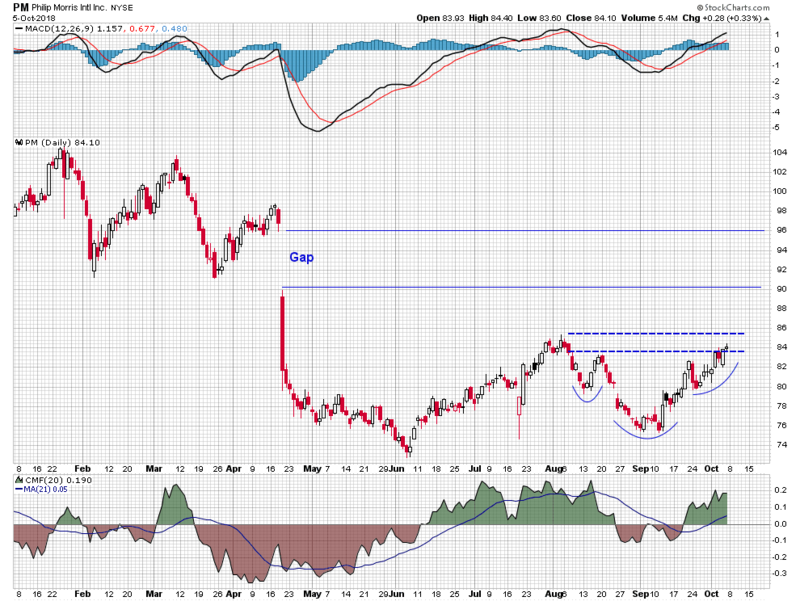 But lately, Philip Morris has been forming an inverse head-and-shoulders formation, one of the most reliably bullish patterns in the book, according to Moreno. The Moving Average Convergence/Divergence oscillator, or MACD, a powerful momentum indicator that helps technicians detect changes in a stock's trajectory just made a bullish crossover last month and has been roaring higher -- another positive development. Plus, the Chaikin Money Flow, which measures the level of buying and selling pressure, went positive in August and has stayed that way. In short, Moreno thinks there's a lot of buying interest in Philip Morris International. If long-term interest rates start going lower, Moreno believes Philip Morris could rebound back to $90 and then quickly fill in the gap, sailing back to $96 and perhaps even higher. But remember, that's a mighty big if. But what if the inflationistas are right, and long-term rates keep rising? Then the banks win, because when longer-term rates go higher, the financials can charge you more for loans. Moreno points out that Citigroup's (C - Get Report) been making higher highs and higher lows since June, with the action forming a rising channel. At the same time, Citi's short-term 50-day moving average just crossed above its long-term 200-day moving average, the holy grail of technical analysis. They call it the gold cross and it's typically a sign that a stock is headed higher. If long-term rates keep climbing, Moreno believes recent resistance will be broken and this stock will roar. His only real concern? The accumulation/distribution line, which tells you whether big institutions are buying or selling, has failed to keep pace with the move, actually going lower as Citi's rallied. If long-term rates simply stabilize, Moreno argues that homebuilders could finally make a comeback. The group's down 25% for the year on fears mortgages are becoming too expensive. But if rates stabilize, Moreno thinks that Wall Street may be willing to circle back to the homebuilders, because it means their worst fears won't materialize. 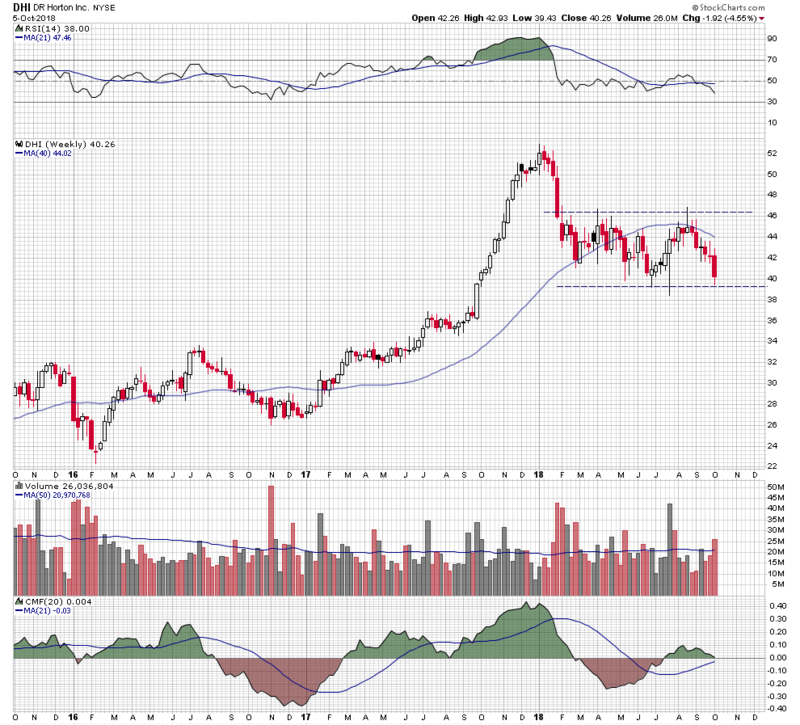 In that case, he likes the daily chart of DR Horton (DHI - Get Report) , which has been one of the better performers. 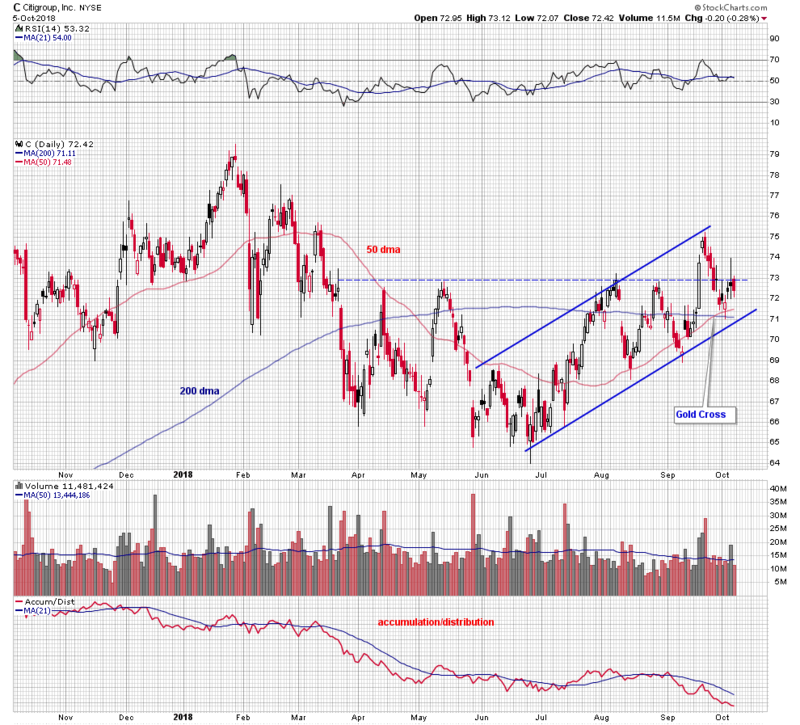 The stock is right above its floor of support at $40, a floor that was successfully retested last week, and if rates stabilize, he could see Horton rallying back to its ceiling of resistance at $46. Cramer and the AAP team are initiating a position in Palo Alto Networks (PANW - Get Report) . Find out what they're telling their investment club members and get in on the conversation with a free trial subscription to Action Alerts PLUS. Over on Real Money, Cramer says the cloud stocks are nowhere finished as a growth cohort. Get more of his insights with a free trial subscription to Real Money. At the time of publication, Cramer's Action Alerts PLUS had a position in C, PANW.